Adding texture to your meal is an instant way to supercharge the flavour. With a mildly spiced coating on your haloumi plus lightly charred edges on your roast veggies, this is a dinner to remember. Preheat the oven to 220°C/200°C fan-forced. Cut the red onion into 2cm wedges. Cut the courgette into 2cm chunks. 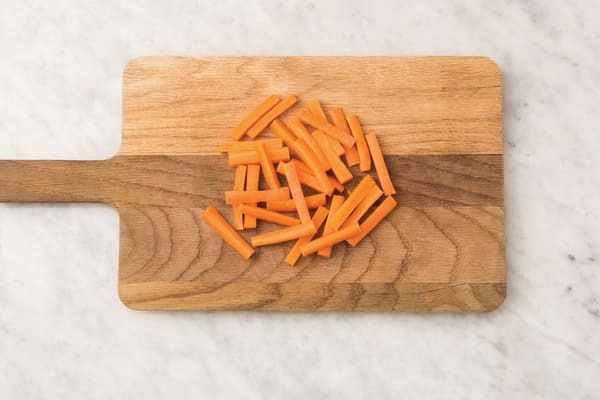 Cut the carrot (unpeeled) into 1cm batons. Finely chop the tomato. Zest the lemon to get a pinch. Cut the haloumi into 1cm slices. Place the haloumi slices in a small bowl of cold water and set aside to soak. TIP: Soaking the haloumi helps mellow out the saltiness! 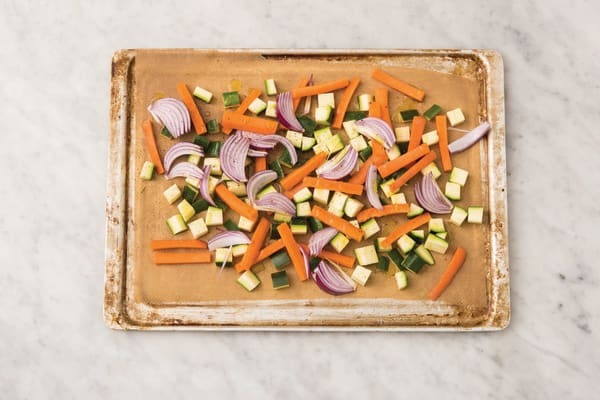 Place the red onion, courgette and carrot on an oven tray lined with baking paper. Drizzle with olive oil and sprinkle with the lemon pepper spice blend. Toss to coat and roast for 15-18 minutes, or until tender and lightly browned. 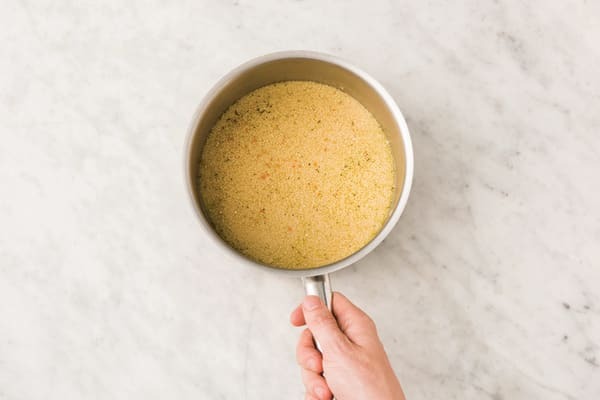 While the veggies are roasting, bring the water and crumbled vegetable stock (1 cube for 2 people / 2 cubes for 4 people) to the boil in a medium saucepan. Add the couscous and a drizzle of olive oil. Stir to combine, cover with a lid and remove from the heat. Set aside for 5 minutes, or until all the water is absorbed. Fluff up with a fork and set aside, uncovered. 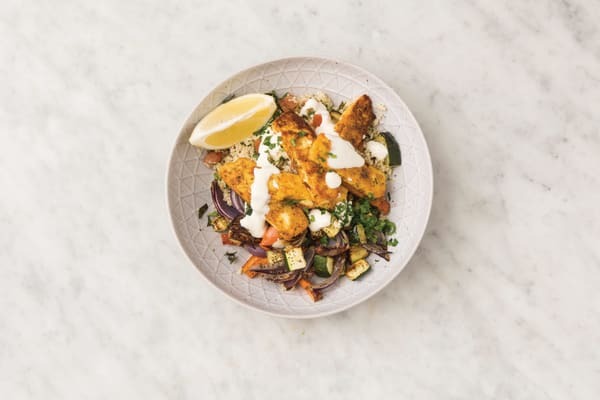 While the couscous is cooking, pat the haloumi dry with paper towel. Place the Souk Market spice blend and plain flour on a small plate. Drizzle the haloumi with olive oil and press into the spice mixture to coat all over. In a large frying pan, heat a drizzle of olive oil over a medium-high heat. 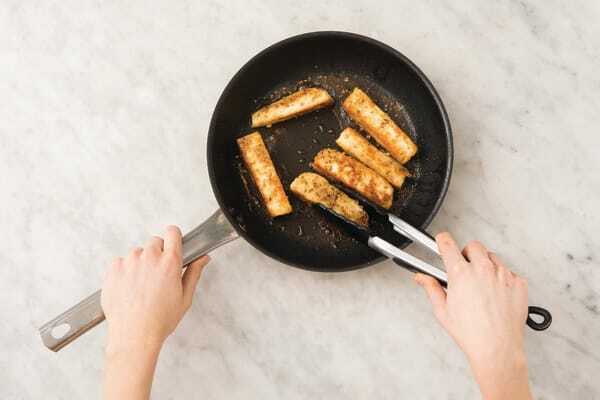 When the oil is hot, cook the haloumi for 2 minutes on each side, or until golden brown. Pick and finely chop the mint and parsley leaves. 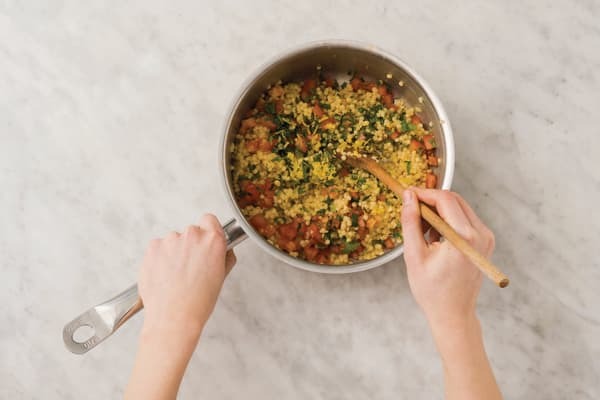 Add the tomato, lemon zest, mint and 1/2 the parsley to the saucepan with the couscous and stir through to combine. In a small bowl, combine the Greek yoghurt, honey and a good squeeze of lemon juice. Cut the remaining lemon into wedges. TIP: Add more or less lemon juice to taste! 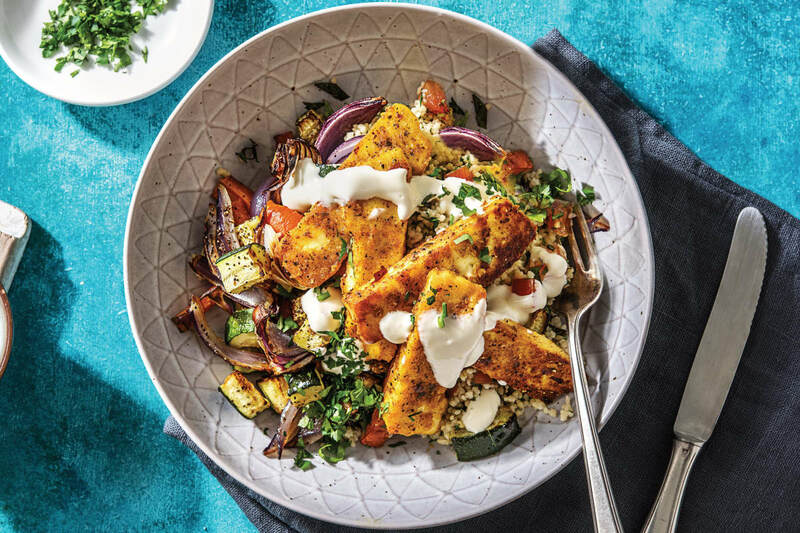 Divide the herbed couscous, roasted veggies and haloumi between bowls. Spoon over the yoghurt dressing and garnish with the remaining parsley. Serve with lemon wedges.